DEARBORN, Mich., Aug. 11, 2010 - For the 2011 model year, the Ford F-150 is getting the most extensive powertrain overhaul in the truck's history. The 2011 F-150 has four new truck engines, all coupled to a revised six-speed automatic transmission. "Our new engine lineup allows greater flexibility for customers to select the powertrain choice that best suits their needs," said Barb Samardzich, vice president of Powertrain Engineering. "We are in the midst of a powertrain revolution, with 30 new powertrains over the next two years, and our loyal F-150 customers are the next ones to benefit." "Truck customers demand an engine that delivers outstanding low-speed torque to help tow or move heavy payloads, and sustained high-load, low-speed operation is a key attribute they look for," said Samardzich. "The engine lineup for the 2011 Ford F-150 has been tuned specifically for truck operation needs and optimized for fuel economy. The result is a lineup that delivers class-leading towing and payload capability with outstanding horsepower, torque and fuel economy." The 3.7-liter V6 powering the base 2011 F-150 is the latest application of the award-winning Duratec V6 engine, with additional technology and upgrades for truck application. In particular, more work was done on the bottom end of the engine, a strong point of all Duratec V6 engines. "This is a well-designed engine with a massive amount of attention to detail around the block and the structure of the block," said Jim Mazuchowski, V6 engines program manager. "This attention to the stiffness and rigidity of the bottom end, how the engine is fastened with four-bolt mains and two side bolts, enhances durability and NVH (noise, vibration and harshness)." In addition to engine durability, Ti-VCT leads a host of technologies that increase overall engine efficiency. Ti-VCT's precise and variable control of the intake and exhaust camshafts optimizes performance and fuel economy. The piston squirters enable faster engine warm-up, and the polished buckets reduce friction, which aids fuel economy. The hardware added to the 5.0 specifically for F-150 includes: an additional oil cooler, which helps extend the life of the oil to 10,000-mile intervals; foam covers for the fuel injectors to reduce NVH; and cast exhaust manifolds for improved durability. The new aluminum block is 70 pounds lighter than the 5.4-liter V8, which aids fuel economy and improves handling. The engine's forged-steel crankshaft also ensures durability. "This engine uses proven technology to deliver a great combination of low-speed torque and fuel economy with the durability F-150 customers demand," said Mike Harrison, V8 engine programs manager. 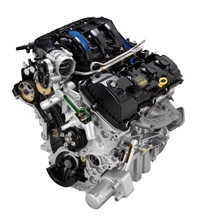 The 6.2-liter V8, standard on the 2011 F-Series Super Duty, is uniquely tuned for the F-150 with a special cam profile. The engine will be standard on the 2011 F-150 SVT Raptor and other specialty applications, and pumps out up to 411 horsepower and 434 lb.-ft. of torque - making the F-150 the most powerful truck in its class. "This engine has tons of torque, and already has been proved in the field with both the F-150 SVT Raptor and Super Duty," said Harrison. With SelectShift, customers can get full manual function by pulling the shift lever into "M" for manual mode and then select the gear desired by pressing the "+" button for upshifts or the "-" button for downshifts. The control system will hold that gear for a full manual transmission feel. The new engines for the Ford F-150 follow the all-new engine lineup for the 2011 Ford F-Series Super Duty introduced earlier this year and highlighted by the 6.7-liter Power Stroke V8 turbocharged diesel, which delivers best-in-class torque, horsepower and fuel economy. "The new powertrain lineup for the 2011 F-150 will provide a wide range of choices to customers to suit their needs, each tested for maximum durability and reliability with outstanding fuel economy," said Samardzich.